﻿﻿Don’t just drive through — Waco’s mammoths, Bears and museums are worth a stop. ﻿Waco got its name from a tribe of Southern Plains Indians who had a substantial village along the mid-Brazos River before the Anglo settlers came and for a short while afterward. But a less imaginative person could as fittingly have called the settlement Central City, because that’s what it is. Indeed, for most people who live in Texas, Waco’s not a bad drive. Only 100 miles north of Austin and the same distance south of the Dallas-Fort Worth Metroplex, it’s within two hours of millions of Texans. Consider that Waco’s just 180 miles from either Houston or San Antonio and factor in the cost of gas, and you can see why Waco sounds like a reasonable destination from just about anywhere. But as I discovered on a three-day visit, Waco has much more to offer travelers than its central location. Over a long career, I’ve been to or through Waco many times. What I found is that I’d covered only the high spots all these years. Sure, I’d been to the Texas Ranger Hall of Fame and Museum, the Dr Pepper Museum (the soft drink was invented at a Waco drugstore in 1885) and the nationally known Cameron Park Zoo, but there’s much more to do in this city of 125,000 that’s home to Baylor University. With help from a few Waco friends and the city’s Con­vention and Visitors Bureau, I set off in new directions. 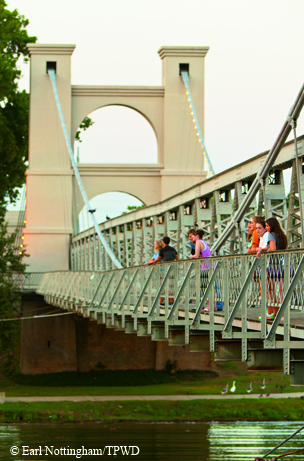 ﻿﻿﻿An 1870 suspension bridge spans the Brazos River in Waco. Wanting to find the true feeling of Waco, I decided to find an interesting bed and breakfast rather than a cookie-cutter motel room. The one I settled on, and I’m glad I did, is Pam and Rick Allen’s Colcord House on the near-south side of town. A prominent Waco banker and his wife built the Colonial-style house, and two generations of the family lived there before it went on the market. Rick’s a school counselor for special education kids, and Pam is a graphic designer. They bought the two-story, 1920-vintage brick house in 1995. Five years later, they converted the carriage house behind it (nobody had carriages in 1920, but they still called it that) into a B&B. When that venture proved successful, they added a living area to the back of the main house and transformed most of the original part, including three upstairs bedrooms and a spacious parlor and dining room, into rentable space. Breakfast the first morning was an herb-infused omelet (Rick grows herbs in raised beds in the yard), fresh fruit and toasted raisin bread with a Texas-made cherry-brandy jelly. The next morning’s fare was just as tasty: a cheese quiche with maple bacon. My first stop after leaving the Allens’ B&B was the Texas Ranger Hall of Fame and Museum for a visit with Byron Johnson, its longtime director. First opened in 1964, the museum has grown from a single, rustic-looking stone and wood-shingled building called Fort Fisher (after an early Ranger outpost on the site) to a multistructure complex just off Interstate 35 on the south side of the Brazos. From the only known oil painting from the life of legendary Ranger Capt. Jack Hays to the rifle Capt. Frank Hamer was carrying when he and other officers ended the outlaw career of Bonnie and Clyde in 1934, the museum’s artifacts and exhibits tell the story of the nation’s oldest law enforcement agency. 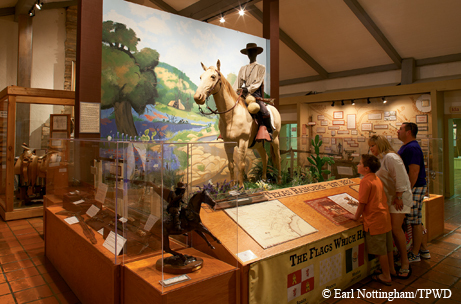 T﻿﻿﻿﻿he Texas Ranger Hall of Fame and Museum documents the storied history of the Rangers. A new library and archive opened in September, and contingent on funding, Johnson and his board of directors have plans for a new high-rise facility he hopes will be topped with a restaurant that will offer a commanding view of the Brazos River below. Speaking of food, Johnson recommended Buzzard Billy’s for supper. First opened in 1993 in downtown Waco, the restaurant marked the beginning of the slow-but-steady revitalization of Waco’s urban core, an area that had never fully recovered from the devastating 1953 tornado that leveled much of that part of town. In 2008, the restaurant moved to the north side of the river at its present location, just west of the I-35 bridge, which the Texas Department of Trans­portation is in the process of expanding. Though it doesn’t have a particularly appetizing name, Buzzard Billy’s offers a great view of the river and downtown and downtown’s signature high-rise, the Alico Building, which reigned as the tallest building in Texas for years. Buzzard Billy’s features a good menu of New Orleans-style food. Since I’m trying to diet and have no grudge against Amer­ican alligators, I opted for shrimp creole rather than fried gator “fingers.” The big bowl of creole came with a basket of good-looking rolls that I reluctantly decided to forgo, but bread does not get wasted at Buzzard Billy’s, because swimming off its riverside deck are perhaps the happiest, fattest ducks, turtles and blue catfish anywhere along the Brazos. Considering the 103-degree heat that summer evening, I sat at a booth inside and watched kids and a few parents tossing pieces of rolls to the critters on or in the water. One couple posed for photographs. Checking out the deck, I saw that the management posted fact sheets providing details on all the species known to participate in the restaurant’s handout program. Back at the Colcord House, I had a good night’s sleep in a king-sized, pillow-smothered bed big enough for a Baylor University volleyball tournament. Turns out that unlike many B&Bs operating in old houses, this is a ghost-free facility. 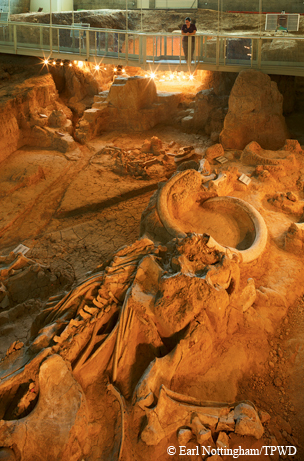 While the Colcord House has no skeletons rattling around in its closets, I did have old bones on my mind the next morning, namely the Waco Mammoth Site. In 1978, two 19-year-olds were walking a dry creek bed looking for arrowheads in a rural area about a mile from the Bosque River between downtown and Waco’s regional airport when they noticed a bone protruding from an eroded section of bank. At first, knowing that the area used to be a dairy farm, they figured it was a cow bone. But as they worked their find free from the dirt, they realized it was a lot bigger than a bovine bone. In fact, they thought, it must have belonged to a dinosaur. ﻿﻿A suspended walkway provides a stunning overhead view of the lost world of mammoths and other Columbian mammals at the Waco Mammoth Site. They took the bone to a museum at Baylor University for identification. Soon they learned that while it wasn’t a dinosaur bone, it was old. And it sure wasn’t a cow bone. Turns out it was from a Columbian mammoth, prehistoric ancestor of the elephant. To condense a long and interesting story, subsequent archaeological work at the site revealed that the two guys had accidentally discovered what is now considered the largest burial site of Columbian mammals in North America, and the second-largest in the world. On top of that, the Waco site is the only known discovery of what paleontologists call a nursery herd — mom and the kids. I knew that I’d find the site interesting, but I had not expected to be blown away by it. I can’t think of any other way to put it: This site is a must-see for anyone planning to visit Waco. No wonder Congress is considering a bill to designate the site a national monument and a part of the National Park Service. For supper, I went to my old Waco standby eating place, the Elite Café, on Waco’s famous traffic circle, just off I-35. The Elite’s been in business under various owners since 1919 (originally downtown), and I remember eating there as a kid in the mid-1950s, pre-I-35 and pre-automobile air conditioning. Keeping my diet in mind, I opted for grilled chicken breast with vegetables and rice. Frankly, visiting all of Waco’s attractions easily can take more than three days. If a long weekend is all you have, you’re going to have to do some planning and decide on your personal must-sees. That said, anyone thinking about going to Waco should consider the mammoth site and the Texas Ranger Hall of Fame as anchors. Waco really does have the proverbial “something for everyone.” If you like Texas history, beyond the Ranger museum and the Dr Pepper Museum, Waco has the 1870-vintage suspension bridge over the Brazos, five restored antebellum or Victorian homes and a half-dozen smaller museums. Sports fans will enjoy the Texas Sports Hall of Fame, not to mention home games of the Baylor Bears football and basketball teams. Preliminary work is under way on a new football stadium on the north side of the river directly across from the Texas Ranger museum and Baylor campus. A pedestrian bridge will connect the stadium to the campus, and city and tourism officials believe the stadium will stimulate more development. For families, the 52-acre Cameron Park Zoo is the kind of facility you’d expect to find in a much larger city. And the 416-acre Cameron Park, one of Texas’ largest municipal parks, is an urban jewel where visitors can do anything from picnicking to rock climbing. During summer months, the newly opened Hawaiian Falls Waterpark should keep the kids wet and happy. Outdoor enthusiasts have Lake Waco on the western edge of the city for fishing and boating. The nearby Lake Waco Wetlands is a 180-acre site with habitat for a wide variety of flora and fauna. The site has an interpretive center, an observation deck and a walking path. 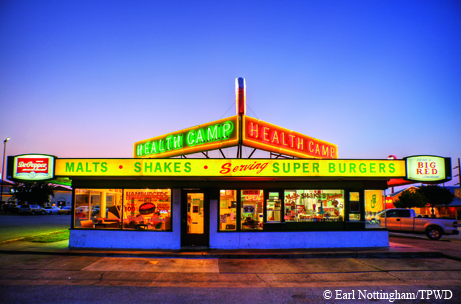 ﻿﻿﻿Health Camp, which opened in 1948, is a Waco dining landmark. Lunch on my last day in Waco was a cheeseburger at the Health Camp, a hamburger place on the traffic circle, across the parking lot from the Elite Café. Opened in 1948, it’s a local food landmark popular with travelers as well. Obviously impressed with its name, Elvis Presley reportedly ate there in the 1950s. He also is said to have been a customer at the Elite. The last attraction I visited, again a place I’d never been before, was the Mayborn Museum Complex on the Baylor campus. Despite the campus location, parking was easy, and the two-story museum well worth the stop. While it’s primarily a natural science museum, behind it is a 13-acre Texas village made up of restored vintage structures. By the time I got through walking around the Mayborn, it was late enough in the afternoon for an early supper. During the George W. Bush presidency, whenever Bush visited his ranch at Crawford, the White House press corps descended on Waco. One of their favorite places to eat was George’s — no, not that George. I’m talking about George’s Restaurant on Speight Avenue. I had a Greek salad that more accurately should be called a Texas-Greek salad, since in addition to olives and feta cheese, it featured strips of flank steak highly reminiscent of fajita meat. I left George’s, and Waco, full but still feeling pretty good about my diet.